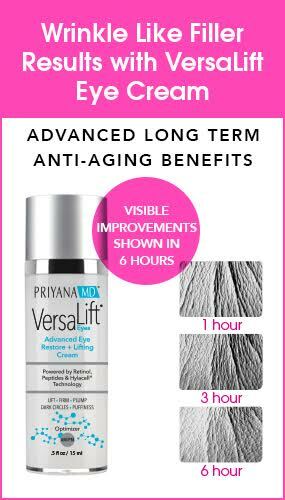 VERSALIFT® EYES ADVANCED EYE RESTORE + LIFTING CREAM is your instant gratification in a bottle and natural wrinkle reducer! Finally an eye cream formulated to do it all with the ultra-effective power of Tri-Peptide antioxidants, Hyaluronic Acid, vitamins, plant stem cells, and retinol your skin will immediately look and feel more smooth, and supple. Our rich formula includes proprietary time-released Hyaluronic Acid anti aging serum for wrinkles. Yeni Gomez, Office Manager at Resnik Dermatology states, "VersaLift it is the best eye lid lift product we have ever used and the best cream for dark spots, dark circles, puffiness and uneven skin tone. We cannot keep it in stock! 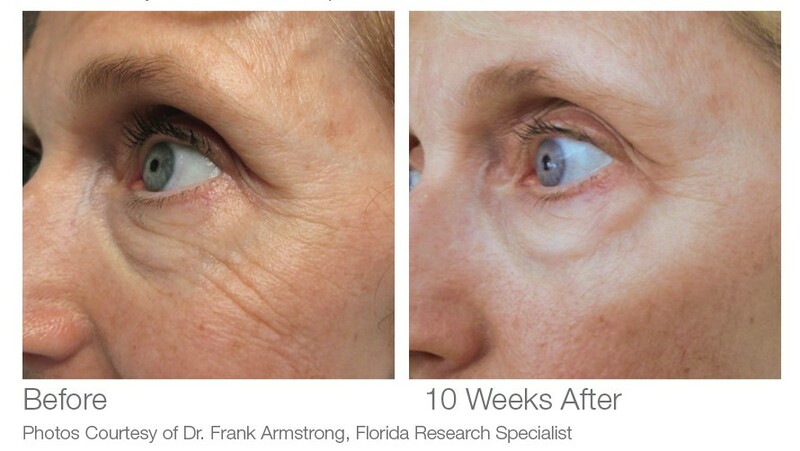 "Finally…the noticeable signs of aging gone in an instant, without the wait! On clean skin, gently pat cream, using a light patting motion under the eye, which gently presses the product into the eye area. Follow that gentle glide along the upper orbital bone on upper eyelids working from the outside of the eye to the inside. I use this product daily and have noticed a wonderful change in my eyes. Puffiness and dark circles are diminished. I love it! I like the eye cream because it goes on smoothly and is not sticky or greasy -- easy to apply concealer afterwards. It hasn't helped much yet with wrinkles, but we'll see. I know it takes a while. Best eye cream we have used in years. We sell out weekly! Excellent results. I personally use it. I am a 43 year old female who is trying to slow down the aging clock. I was recommended by my Dermatologist to use HylaCell Youth Accelerator Human Growth Factor and I saw this product on their site as well and decided to call and get more info on it. I have only been using VersaLift Advanced Eye Restore + Lifting Cream for almost 3 weeks and I can already see the dark circles under my eyes getting lighter. I use it at night before bed, and in the morning I can see a difference in the puffiness under my eyes. This is a great product and Melissa was so helpful with all of my questions and concerns!! The product is a little pricey, but definitely worth it, and a little bit goes a long way. A definite 'Must try'!! I love the eye cream. it does every thing it is supposed to do. what a wonderful product. eyes has tightened. I'm very happy with the Versa Lift Eyes and would highly recommend this product to everyone.